Practising yoga postures is for me viscerally exhilarating. My āsana practice is the instantiation of the voices of yogins calling from the past, echoing and fracturing, morphing and recreating within my body, breath and intention. Studying yoga’s history enables us to understand what and why we are practising. Rich yogic body accounts give maps–-structures which we can envision and manipulate for power and freedom. In the history of yoga we excavate ideas of psychology, cosmology, our experiences of pain and love, and the mechanics for how we can at once transcend and wholly live these human experience. My initial approach to the complex phenomenon of yoga and its history is to impose order on a vast and interwoven field. I seek to compartmentalise, stereotype, categorise and frame – because I want to understand the perspectives and agendas of these voices – ancient and modern – that are claiming to interpret the wisdom of yoga for me. Perhaps after simplifying we can delight in the complexity of these stories. This inquiry can be seen as an integral part of spiritual study – svādhyāya – learning about the texts, the teachings, the Self – learning about ourselves. This is a self-reflexive project, shedding light on our bricolage, our castles of practices and perspectives that help us make sense of the world and our place in it. Studying the many sources of the yoga tradition gives us a broad perspective to evaluate claims of cultural appropriation – of the theft, sacrilege, commodification and selling of wisdom practices. Presentations and self-representations of yogīs reveal a posturing for success which prefigures social media. Exploring alternative perspectives – India has a long history of philosophic debate – invites us to examine divergent views and perhaps become less sectarian, less divided, less cultish. We construct and reconstruct our reality in every moment (according to the theory of saṁskāras or the subliminal impressions of actions). Exploring this theory as a lived possibility in our bodies allows us to soften the ossifications of our psyches. The pantheon of characters – the ferocious deity, the leaping Hanuman, the despairing Arjuna and the tranquil Buddha – shadow our psyches, express possibilities of ourselves. In an experiment of embodied archaeology I worked with historians and Sanskritists to recreate postures described in a forgotten text – the Haṭhābhyāsapaddhati. The descriptions are brief and the interpretations endless. The project connected me back to those practitioners who explored with their bodies being fit (militarily so), negotiating social status, becoming free. Practitioners who were using similar techniques as us to understand and leverage their position in the world. Yoga theory and philosophy can at times appear a distraction, an abstraction from practice. The c. 1450 Haṭhapradīpikā rounds off with the admonition to practice – else it’s all the nonsensical babbling of a madman. Threads of the history and philosophy of yoga are the web of our practice, re-spun in our veins and our breath when we practice. 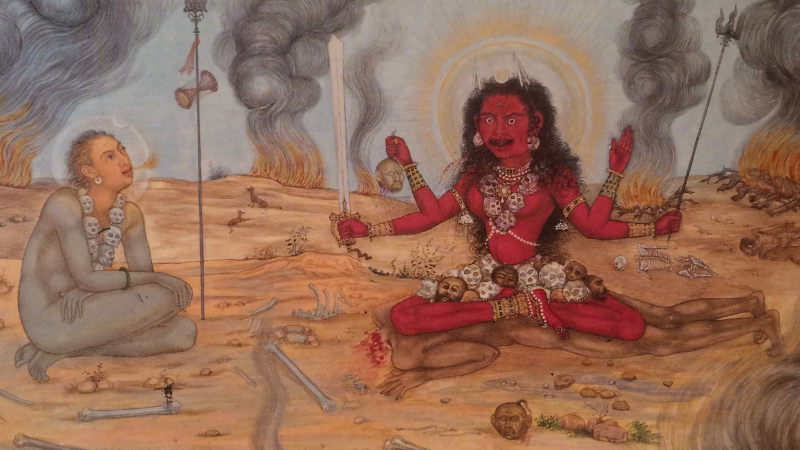 ‘The Goddess Bhairavi Devi with Shiva (detail). Attributed to Payag. India, Mughal dynasty, ca. 1630-35‘ David Gordon White, ‘Yoga in Transformation’ in Diamond, Debra et al, Yoga: The Art of Transformation, Smithsonian Institute, 2013, p. 40. 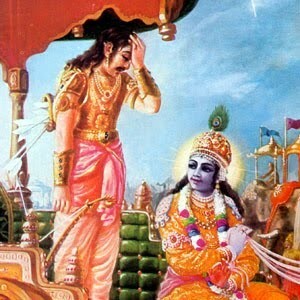 Arjuna’s despair, the Bhagavad Gītā. 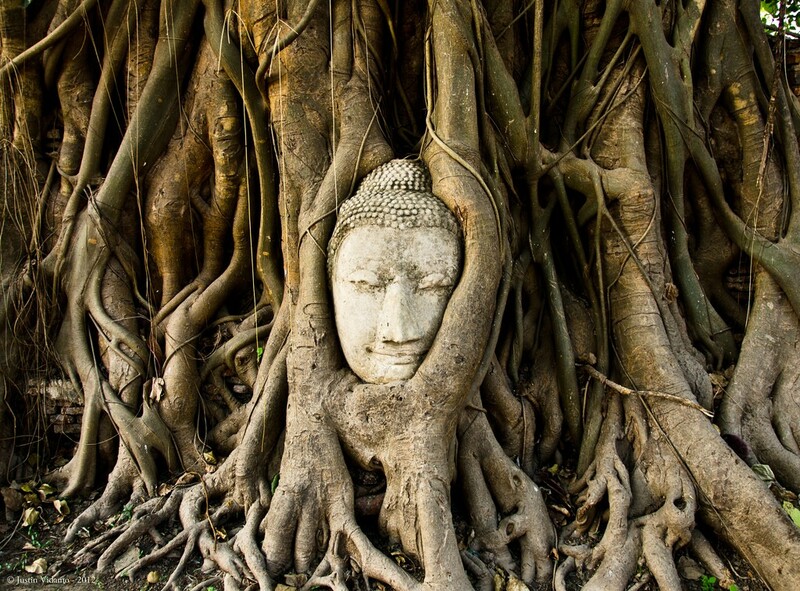 Buddha, Wat Mahathat, Ayutthaya, Thailand. Hanuman leaping. The Mewar Rāmāyaṇa, c. 1650, p.36. British Library digital archive.